Females have a soft carapace, or outer shell, and a translucent exoskeleton through which the red and yellow inner organs are visible. Males, however, have a hard carapace and are yellow or gray in color with patches of brown. Females can typically measure 8mm-12mm. Males are considerably smaller, and can only grow up to 7mm. Pea crabs are just as, if not more, dependent on their host than their actual habitat. Bivalves, the most common host of P. Pisum, are generally found in the upper intertidal zone of rocky marine shores. Pea crabs have considerable variation in their geographic habitat. They can be found along the Northern hemisphere of the Eastern and Western coast of the United states, Europe, British Columbia, and Canada. Adult pea crabs do not survive well in salinity less than 20 ppt, and survival rates in the larval stage decrease with colder temperatures (Kruczynski 1973). 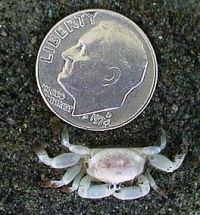 Pea crabs and hosts can be found at depths of 0-60m. The Pea Crab is a parasitic creature, living inside of marine bivalves. While mollusks are the prefered hosts, other possible hosts include sea cucumbers, sea urchins, parchment worms, or mud shrimps. The host is used for safety, food, and oxygen. The relationship between a pea crab and its host is parasitic rather than mutualistic because the pea crab can damage the host during its inhabitance. If the host is a mollusk, the crab lives inside the mantle cavity, which functions as a respiratory chamber for the host. The presence of a pea crab causes gill damage, and infected mussels show considerably lower tissue weights and slightly greater shell weights than uninfected mussels of similar size (R. Seed 1969). A study by Rosina M. Bierbaum and Scott Ferson in 1985, concluded that in blue mussels (Mytilus edulis), pea crab inhabitance causes shell distortion and reduced growth rates. In addition to residing in its respiratory chamber, the crab harms the host by feeding off of the plankton brought in through the gills, essentially stealing its food. There are two stages of reproduction for the pea crab. The first stage takes place inside of the host, and the second stage takes place outside of the host. A female pea crab, her eggs having been fertilized before she entered her host, will release larvae that grow into juveniles of both sexes. Once these juveniles reach maturity usually around the month of May, they leave the host and mingle with other pea crabs in the open water to mate. This stage is the only time in which a female crab has a hard carapace and is outside of a host. After fertilization, the males die and the females re-enter their host where they wait until August to release their larvae and start the cycle all over again. Kruczynski WL. 1973. Distribution and abundance of Pinnotheres maculatus Say in Bogue Sound, North Carolina. Biological Bulletin 145:482-491. Bierbaum RM and Ferson S, 1986. Do symbiotic pea crabs decrease growth rate in mussels? Biol Bull 170:51–61. Charles Fransen & Michael Türkay. "Pinnotheres pisum (Linnaeus, 1767)". World Register of Marine Species. Inland Water Crustacean Specialist Group 1996. Parapinnixa affinis. In: IUCN 2010. IUCN Red List of Threatened Species. Version 2010.4. <www.iucnredlist.org>. Downloaded on 22 February 2011. This page was last modified on 10 March 2011, at 11:31.